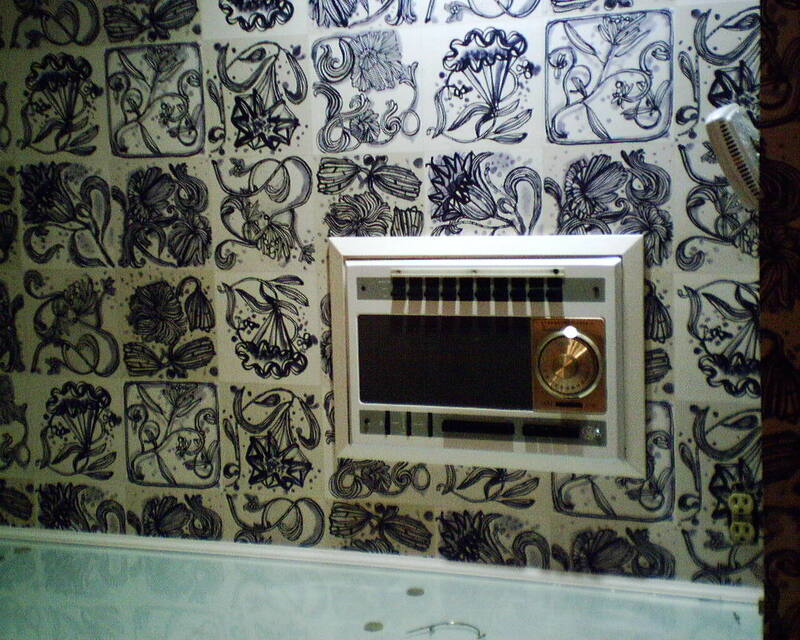 Some people like to cover switch plates with wallpaper. I much prefer the crisp look of clean plates against the paper. 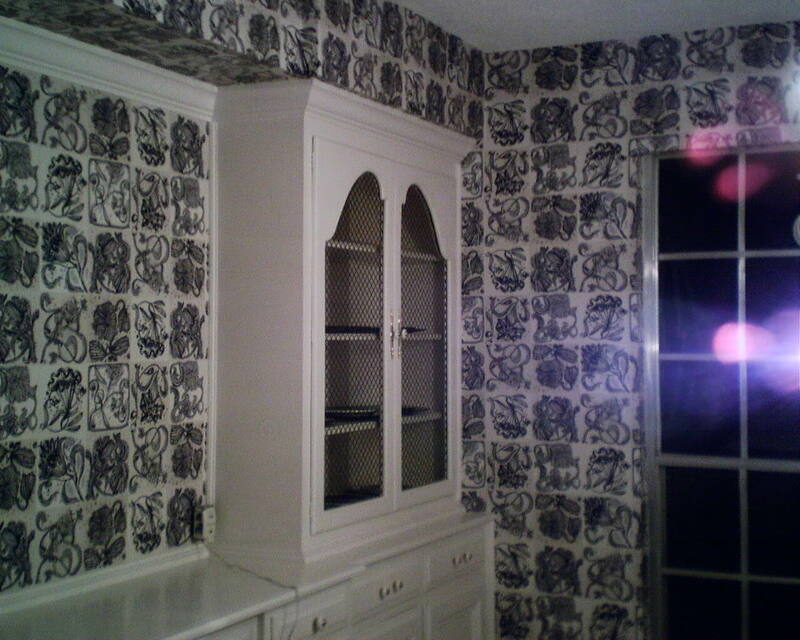 And if covered with wallpaper, they will get dirty quickly, because oil from hands will eventually stain the paper. So here is a nice clean switch plate doing its job to protect the wallpaper. 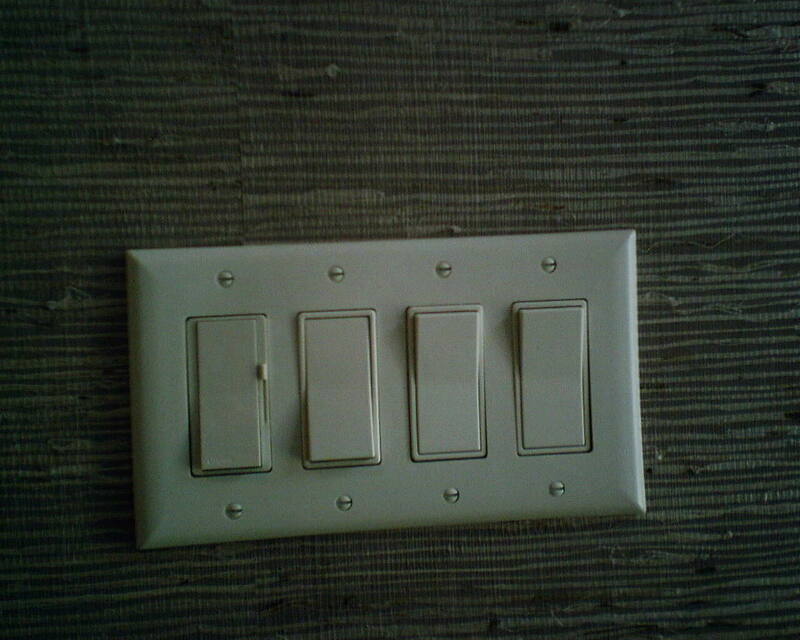 Usually I place the screws so the slits all point upwards, to line up with the sides of the switch plate. But here, with the horizontal element of the grasscloth, I think it looks better to have the slits also run horizontally. They do line up with the horizontal part of the individual switches. Here’s one of those jobs that’s easy to look at, but you don’t realize how difficult and time consuming it was to hang. 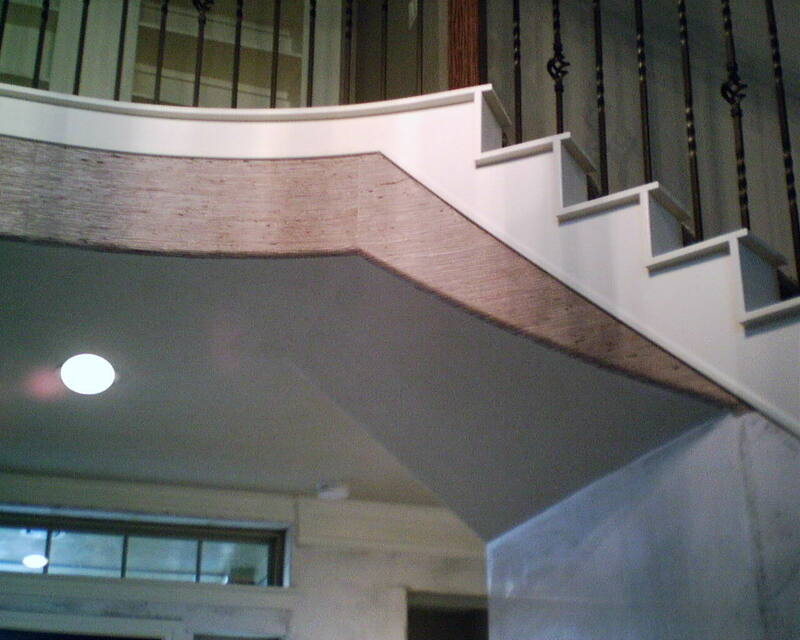 It took a full day to hang this one wall, with its recessed door niche, and the short pieces under the curved stairwell. 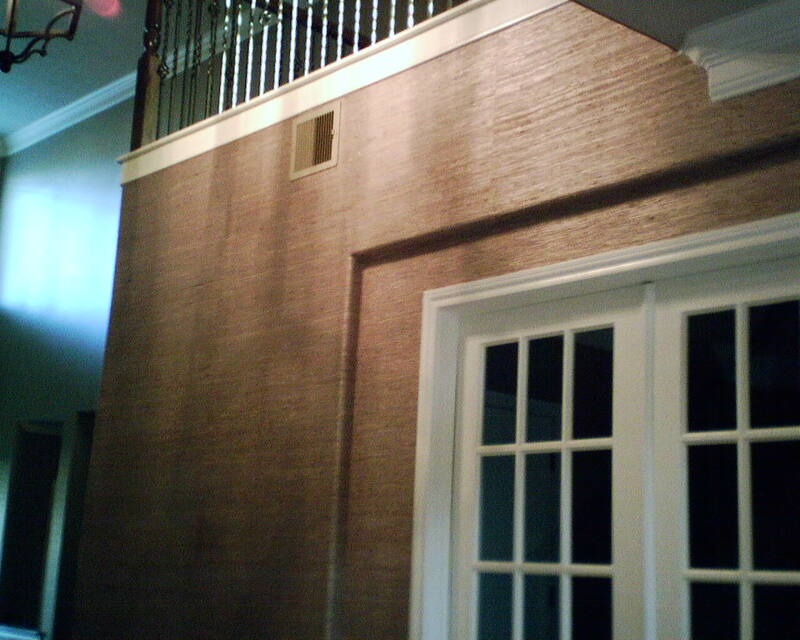 This product is grasscloth, and it helps that, unlike most grasscloth wallpapers, it’s particularly thin and pliable. This helps it conform to the bull-nosed edges and curves in this new home in Sienna Plantation south of Houston. Bull-nosed edges have been all the rage in new construction for about 10 years now. They are nice to look at, lending a softer look to the home. But they are the devil to hang wallpaper on, because you can’t see or feel where you’re supposed to trim it, and because strips of straight wallpaper don’t want to conform to curved walls and edges. But paperhangers have their box of tricks, and, even though it took a lot of time, I got this wall to look great. I still have three other walls in this entry to hang. I am allowing three days total for this job (plus another day and a half for prep). Here is a well-written story of one family’s history in the wallpaper industry. This is interesting to me, because my family also had a wallpaper & paint store, in St. Louis, for nearly 100 years, so we went through many of the decades and trends this article talks about. 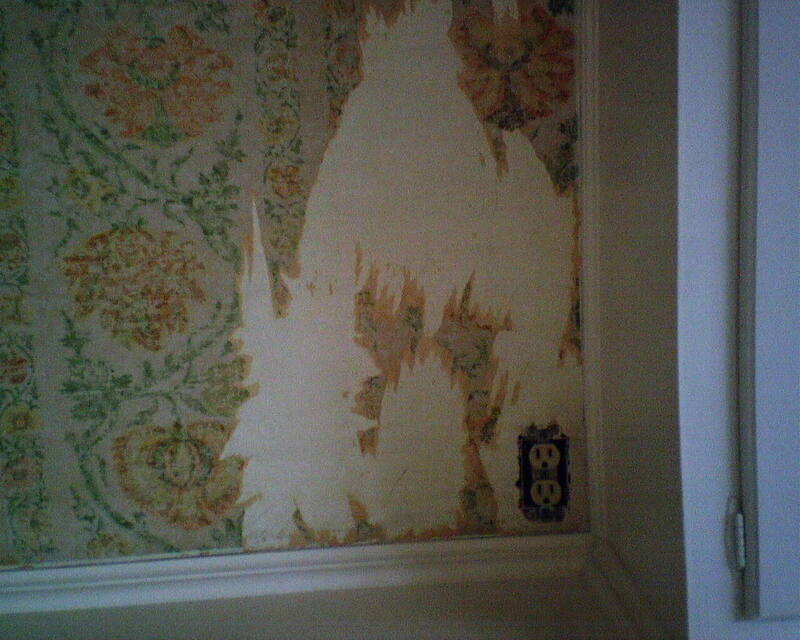 Some unique old homes in Birmingham, Alabama are being restored, and inside them, workers have uncovered MUCH old wallpaper – one room had 28 layers of paper!! Some of these papers date way back to 1859!! This is a fascinating article, with good photos of lovely old wallpapers. OK, here is the same room, clothed in lively blue & white paper from Anthropologie. 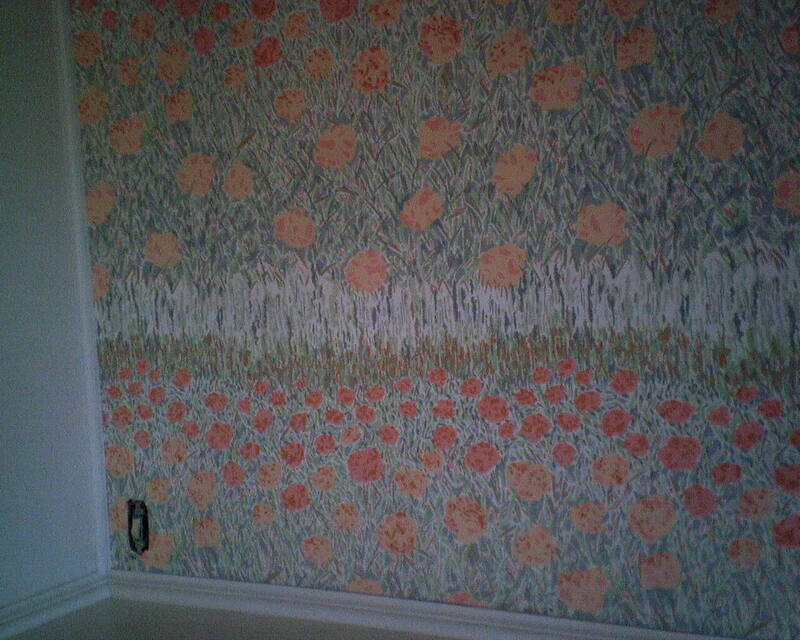 The homeowner found this wallpaper on-line and fell in love with it. It really transforms the room! In the last photo, I humbly invite you to note that the pattern is perfectly centered, left-to-right, as well as top-to-bottom. It also lines up perfectly with the pattern on the fur down above. This was no accident – I spent a lot of time plotting and measuring and engineering how to get this to work out. I figured the homeowners would have something pretty sitting on this built-in buffet – an antique tea set, a beautiful mirror – so I wanted to balance the pattern so it would accentuate whatever they placed in the recessed area. 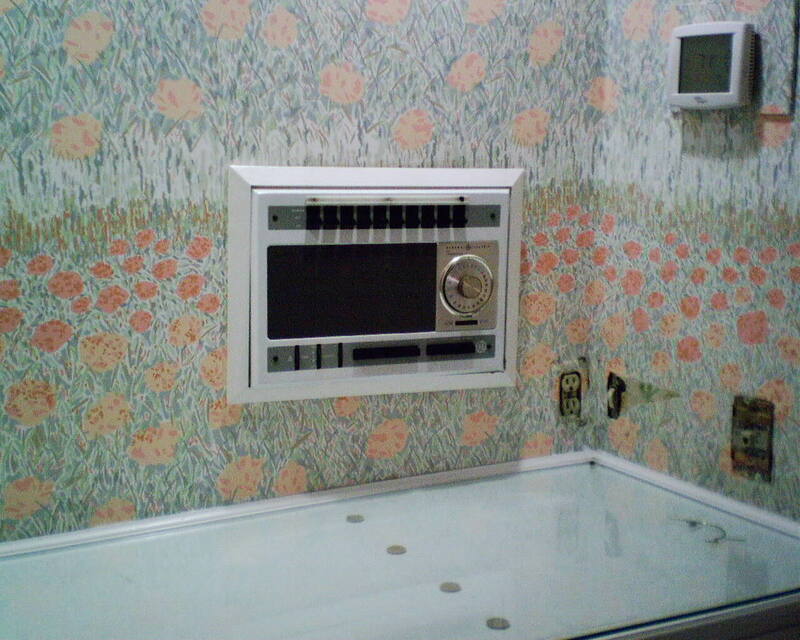 This wallpaper (and the built-in whole house intercom) screams ’70’s. Actually, the wallpaper pattern is not that bad, and I, and the homeowner as well, kind of like it, and it’s such a novel theme that it doesn’t really look dated. Nonetheless, the homeowner has chosen a pretty blue-and-white pattern that will update this breakfast room in an early ’60’s home in South Houston. 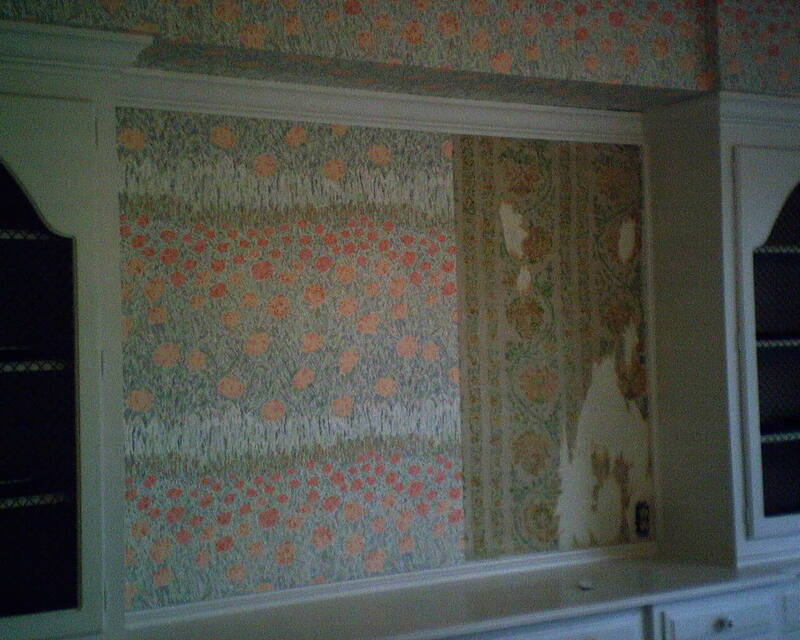 The pastel floral wallpaper was hung over the original green-and-gold paper. I’m always amazed when I see how well the job held up over the years, because the installer did not seal the old paper, and that means it’s likely to absorb moisture from the paste on the new paper, and that leads to bubbling. However, his job looked great, no bubbles, and it has stuck to the wall for about 40 years. Anyway, in the third photo, where I have removed one strip, you can see the original paper beneath. Some of it must have been loose, and the previous installer removed those areas and sanded them smooth. Neither these jagged areas nor the seams of the original paper showed under the pastel paper. The pastel paper stripped off the wall quite easily. The green-and-gold wallpaper could not be persuaded to come off, though, so I floated over some of the thicker jagged areas, sanded, and then primed the walls with Gardz. 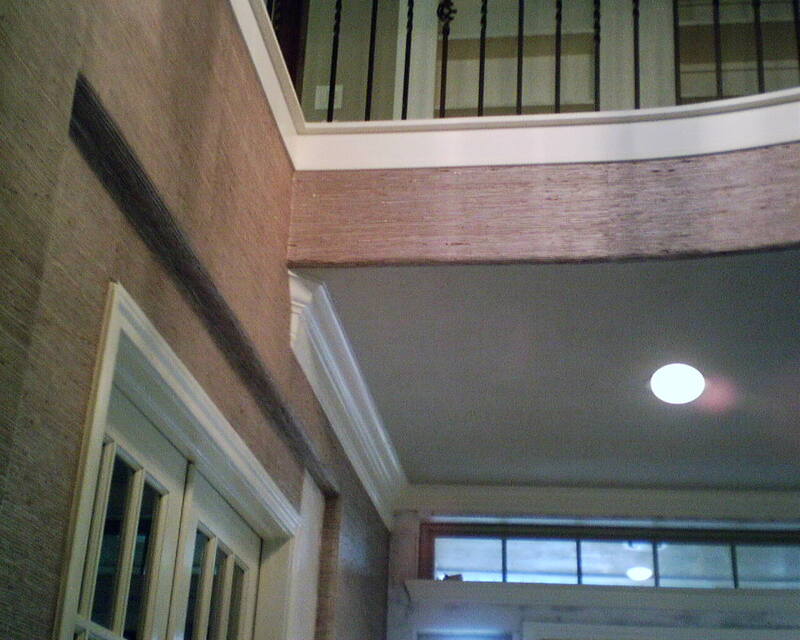 Gardz is perfect for this situation, because it soaks in to porous surfaces such as the original un-coated wallpaper and the joint compound patches, bonds everything to the wall, and seals it so that wet paste from the new wallpaper will not cause bubbling. Gardz also makes it easier to remove the new wallpaper in the future, without damage to the walls. Gardz dries clear. I would prefer it to be white, but pigment interferes with the soaking-in qualities of the product, so, if you really need a white primed wall, you can Gardz first, and then follow up with your choice of pigmented wallpaper (not paint) primer. Did I say I love my customers? 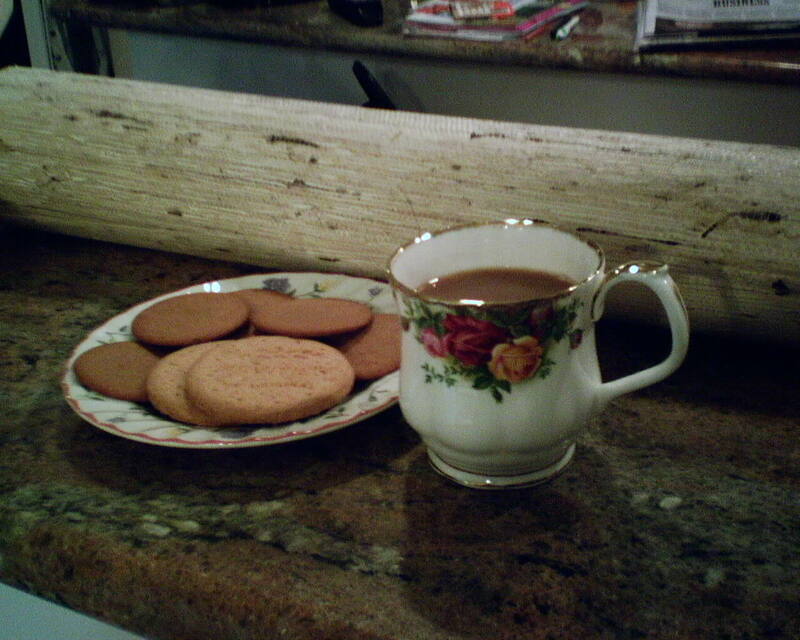 My client this week was a gal from England, and today she made me tea, the way the Brits do, with milk and – no, those are not “cookies” – they are “biscuits.” The British always use real China, with fancy frilly designs, too. Today, I hung a smoky teal blue grasscloth in a nicely done apartment over a garage in the Montrose area of Houston(will do the second wall tomorrow). 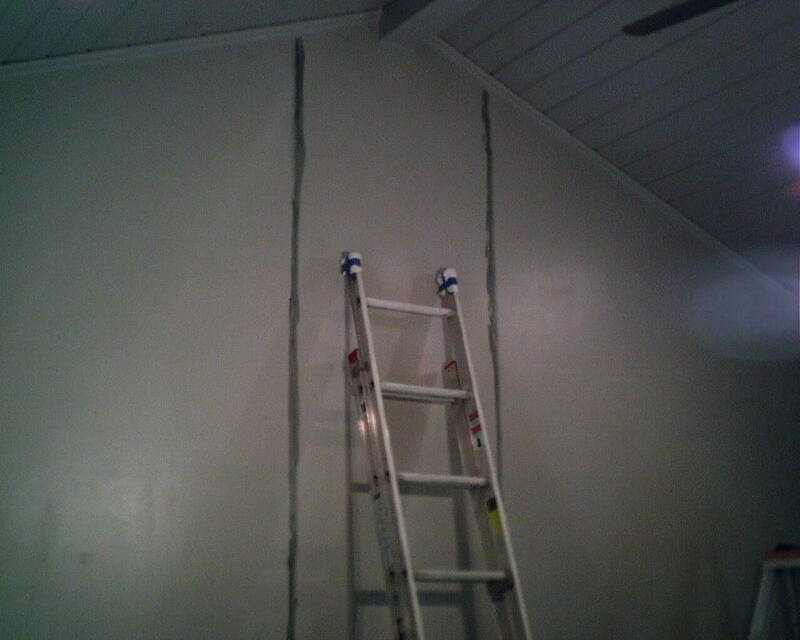 Two of the walls tower to 12′ high, and I needed my extension ladder to get to the top. For this wall, I trimmed all seven strips to be the same width, which, since the seams and panels in grasscloth are very noticeable, is more pleasing to the eye than to have six 36″ strips and one 6″ strip. In the top photo, you see where I have striped under where the seams will fall with dark paint, so if there are any small gaps in the seams, the white will wall not peek through. A couple of things are going on in the second photo. Since the ceiling is angled, a rectangular strip of wallpaper will have a lot of excess paper, which means lot of potential for paste to get on the ceiling. 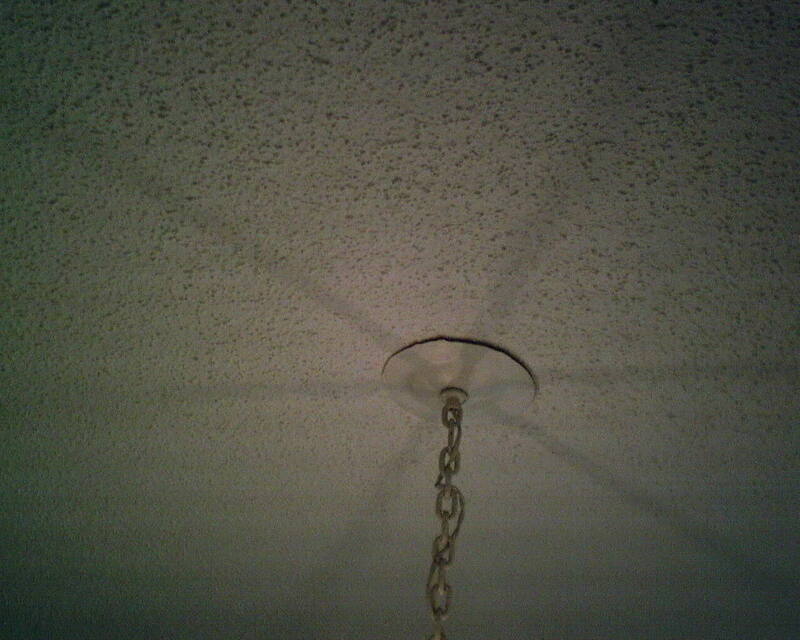 By pre-trimming off some of the excess, I can keep the ceiling nice and clean. It’s awkward working up that high, trying to keep my balance on the ladder, and manipulate a 12′ long strip of stiff material, so I have made rough relief cuts where the wallpaper will meet the ceiling beam. 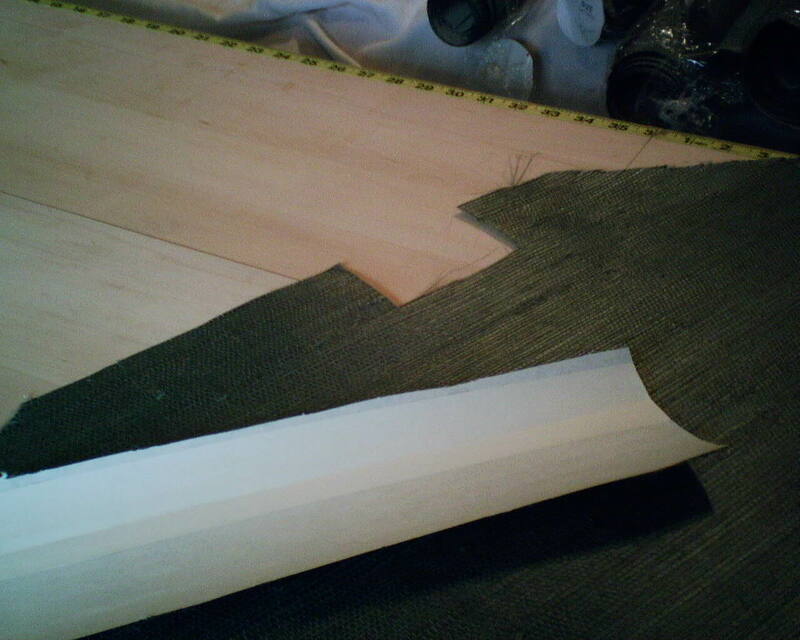 Also in the second photo, you will notice a splice on the back side of the wallpaper, where the manufacturer has joined two pieces of the paper backing. 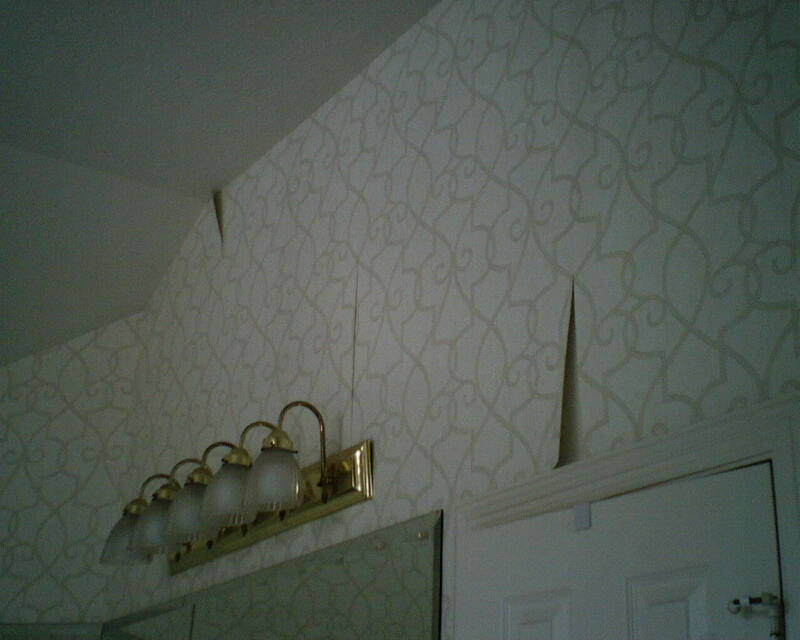 Usually this is a problem, because it creates a bump under the wallpaper. 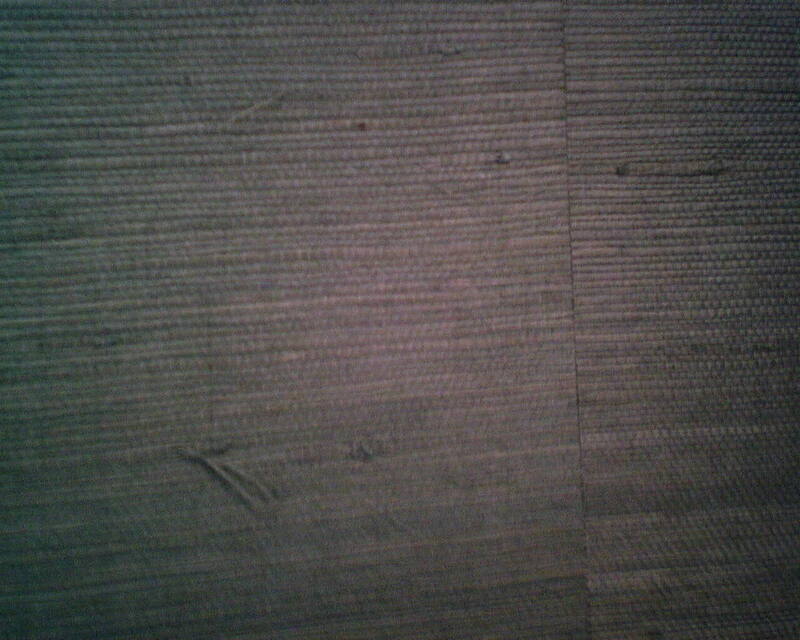 But since grasscloth is heavily textured, usually a splice like this is not an issue. I hung about 14 rolls today and yesterday, and came across two such splices. The third photo shows the finished wall, with the paper fitting nicely up against the beam and the sloped ceiling. I am happy with this grasscloth, because there is no “shading” or “paneling” (difference in color within one strip, or between different strips). It is rare to find a grasscloth that looks this homogenous and this good. The fourth photo is a close-up of the material, including one of the seams, which, in the world of grasscloth, is quite UNnoticeable. Nice! 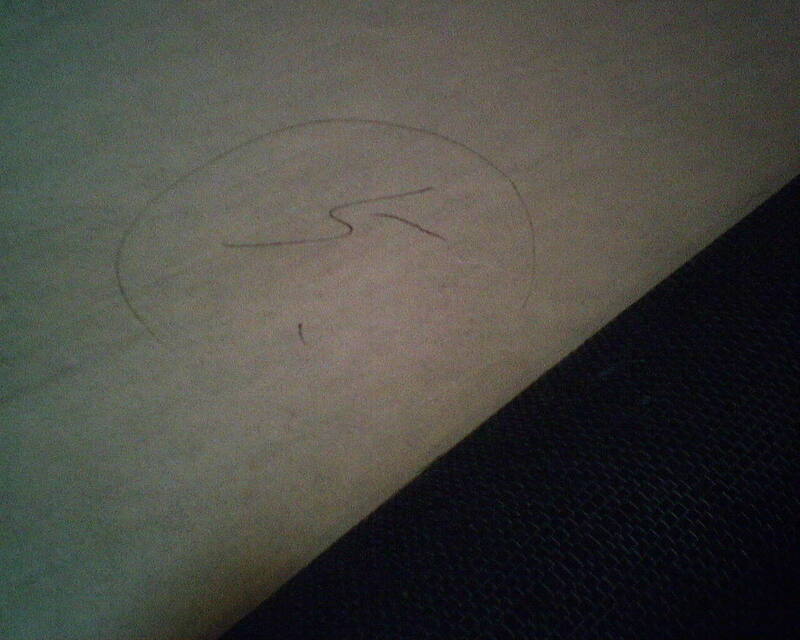 In the next photo, though, you see a mark in ink on the back of the paper. 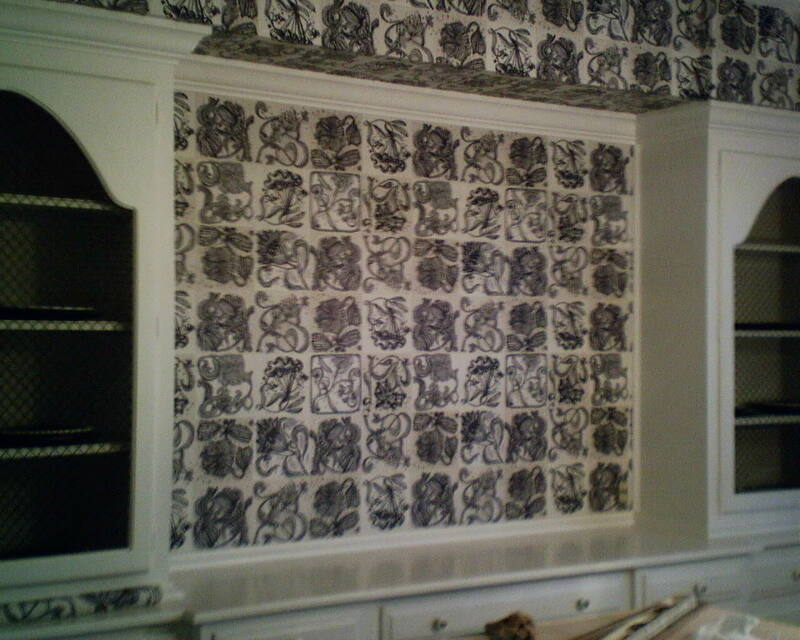 This is cause for concern, because, on many types of wallpaper, ink will bleed through to the surface. This mark appears to have been done with an ink pen, which is odd. There were a number of these, all looking about the same, through several bolts of material. So I was unable to cut around them (could not afford to throw away so much paper), so I had to put the paper up on the wall, and am hoping that the ink will not bleed through. 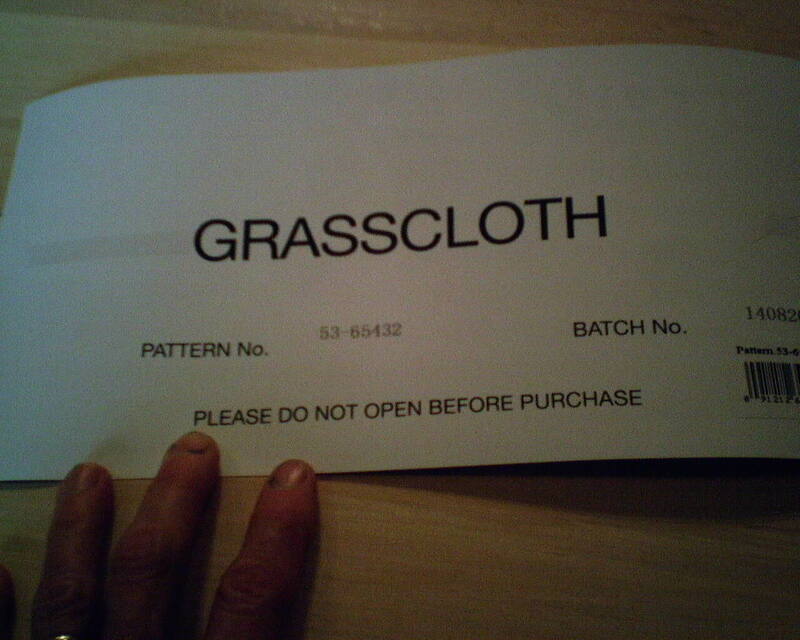 And, last, a shot of the label. I do not know the manufacturer, but as far a consistency of color goes, I really like their product. 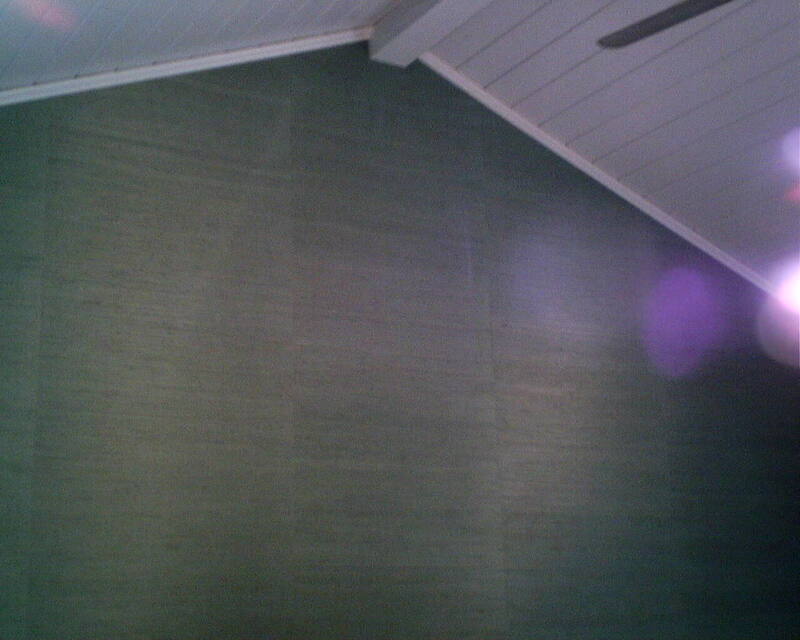 This grasscloth was bought at a discounted price from Dorota Hartwig at Southwestern Paint on Bissonnet near Kirby. (713) 520-6262 or dorotasouthwestern@hotmail.com. Discuss your project and make an appointment before heading over to see her. 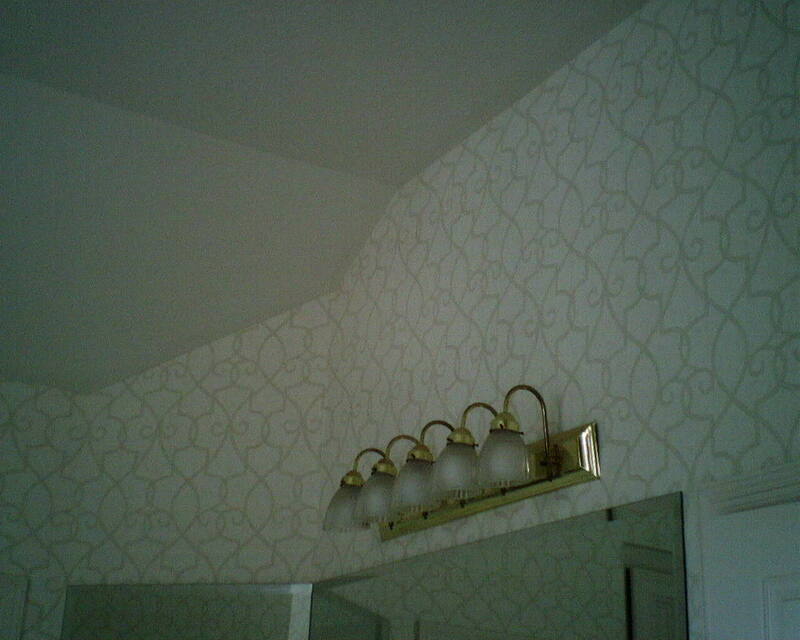 I hung this subdued trellis design wallpaper several years ago in a master bathroom in West University, and am embarrassed to see that several strips have come loose from the wall. This happened only in the tub + shower room, but not in the water closet (a European term that simply means a tiny room for just the toilet 🙂 ). So you can figure that humidity is a factor. I simply climbed up on my ladder and repasted the loose areas, and everything should hold up fine. You are currently browsing the Wallpaperlady's Blog blog archives for January, 2015.